Seven days and seven nights of mystical magic. Explore Peru (Lima, Sacred Valley, Machu Picchu and Cusco) and stay at some of the nicest and unique hotels with like minded souls. This retreat will include planes, trains and automobiles as we travel to various locations. Our retreat includes stays at an old Monastery, one of four higher end hotels. We have hired a guide who will share their knowledge of the local culture with us. In Lima, the Capital we will tour the City of Kings and explore the bohemian neighborhood called the Barranco district preferred by artists, writer and lovers for its serenity and idyllic atmosphere. We will fly to Cusco and visit Awanankancha, a center where South American Cameloids are bred. 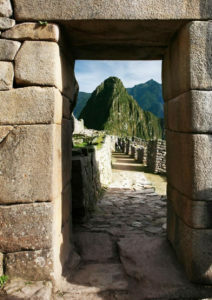 We will visit a town on Inca origin in the Sacred Valley where your eys will feast upon the valleys breath taking views. An afternoon visit and a sunrise at Machu Picchu are on the agenda. Cusco city will include a tour of ancient fortresses and ruins. We will practice the art of yoga (breathing, meditating, contemplating, moving, journaling) throughout our mystical journey. If Peru is on your bucket list, then this is the way to do it. What’s included: all meals, all excursions, all transportation in Peru, all accommodations, all retreat activities, priceless memories, 2 retreat facilitators, local guides, airfare inside of Peru tips and surprise gifts and more. What’s not included: airfare from your home to Lima and any alcohol or gifts or other activities not included in retreat. Cash or Check Cost: $6,997 for double occupancy. Single rooms available for an additional fee of $250 per night. Payment by credit card will incur an additional credit card processing fee of 3%. Direct flights from FLL to Lima (only $500 roundtrip) Grab a friend and say Yes to Into the Mystic.. an experience of a lifetime! Non refundable deposits of $1,500 due by September 8th to reserve your space. If you would like to join us on the is exclusive retreat with limited space, call Monica at (208) 866 6275. *NOTE: Payments made by credit card will incur a 3% processing fee. March 8 - 15, 2019 - Please note that credit card payments incur a 3% credit card processing fee which is included in the amounts below. Please describe the medical condition or injury. Please provide the name of your emergency contact person. Please sign to indicate that you agree to the Retreat Participant Agreement. If you would like to pay by credit card or by PayPal, you may use the form below. Please note that these transactions will incur a 3% payment processing fee. If you wish to save the 3%, you may pay by cash or check. For more information, please call Monica at (208) 866 6275.